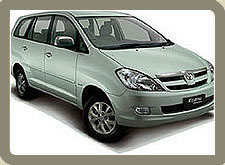 The interior is the innova is quite roomy, probably roomier than the Tavera Innova in india. The Innova's dash is very smart and modern. May get the axe in India due to cost-cutting, we think. interior photo, AC vents The Toyota Innova has four air conditioning vents for superior cooling. Still unclear on whether this will be there in the Indian Innova. The Toyota Innova has is a smart looker from this angle. Let's say, just a little ahead of the Chevrolet Tavera. Welcome to the land of India It has been the most attractive tourist destination around the world. Every year a large number of tourists around the globe come for India Tours, the natural beauty of India. They Tours to India for its interesting and rich culture, magnificent monuments, picturesque landscapes and many eye catching sights. India has numerous reasons why tourists want to Travel to India and spend their holidays. Grandtoursindia.com provides various India Tour Packages for the most exciting and adventurous holidays in India.